Hyundai Motor India Limited (HMIL) marked the production of the 5-millionth car at its manufacturing unit in Irrungattukottai, near Chennai since it started production in the India in 1998.
products to the Indian market. With an investment of US$ 2.7-billion and production capacity of 6.8 lakh cars in the Indian market. "The 5-million car roll-out is an important milestone and a symbol of Hyundai's long-term commitment to the Indian market.As we reach this significant landmark, I would thank our valuable customers, founding partners, employees, dealers and suppliers for their support and commitment. We will continue to focus our efforts in the Indian automobile industry through investments and world-class products," said B.S. Seo, MD and CEO, HMIL. With the 5-million car roll-out, Hyundai also celebrates 15 years of excellence in India accompanied by their long-term association with Shahrukh Khan. 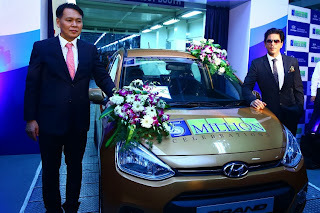 Hyundai and Shahrukh Khan's association has been one of the longest brand ambassador associations in India.